New York goes to the polls Tuesday in a pivotal presidential primary tipped to hand Hillary Clinton and Donald Trump victories in the race to clinch the Democratic and Republican tickets to the White House. The former secretary of state, first lady and New York senator leads the polls by double digits over her Brooklyn-born challenger, Bernie Sanders, even if nationwide surveys put them neck and neck. Trump, the brash Manhattan billionaire whose controversial campaign has appalled the Republican establishment, is streets ahead of his evangelical rival Ted Cruz and Ohio Governor John Kasich. The tycoon is banking on a big home state victory in his quest to sew up the nomination before Republican grandees can deny him the ticket and anoint another candidate at the party convention in July. The polls open at 6:00 am (1000 GMT) and close at 9:00 pm (0100 GMT Wednesday) when Clinton and Trump have scheduled what they hope will be victory parties in Manhattan. To the disadvantage of Vermont senator Sanders, only New York's 5.8 million registered Democrats and 2.7 million registered Republicans are eligible to vote. Independents are barred from participating. With both races for the White House nomination so competitive, it is the most consequential New York primary in decades in the country's fourth largest state that is home to an incredibly diverse electorate. Uniquely, three of the candidates lay claim to calling New York home: Trump, who has never lived anywhere else, Clinton who was twice elected the state's US senator, and Sanders who was raised in Brooklyn. "We all have a stake in America, that is what this election is about. Please, come out! 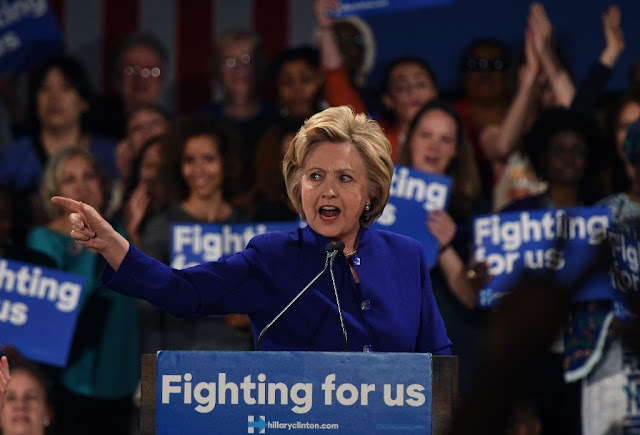 Vote tomorrow," Clinton said Monday in an impassioned plea to become the country's first woman president. She spent the day pressing the flesh in a whirlwind of campaign stops that included greeting nurses, stopping by a car wash, chatting to kitchen workers and eating ice cream. In the evening, she made a joint appearance with her husband, former president Bill Clinton, at a Manhattan rally for Irish Americans. A big victory in the state, which elected her over Barack Obama in 2008, would stall the momentum generated by her self-styled Democratic socialist rival who has won seven out of the last eight state votes. Clinton holds 1,790 delegates compared to 1,113 for Sanders, putting her on course to scoop the 2,383 needed to secure the party's ticket. Only California has more than the 247 Democratic delegates and 44 superdelegates up for grabs in New York. Sanders, 74, who has galvanized a youth movement with his call for healthcare as a right, free college education and campaign finance reform, needs a win to keep alive his hopes of winning the presidency. "If we get a larger voter turnout again tomorrow we're going to win again in New York," he told a rally in Queens late Monday. But earlier in the day he signaled he could be willing to swing behind Clinton, should she win the nomination, provided she move further to the left on causes that he has highlighted. "It's a two-way street," he said. "The Clinton people are going to have to say, 'you know, maybe Bernie has a point,'" he told CNN. On the Republican side, Trump hopes that winning the majority of New York's 95 Republican delegates can lessen his chances of facing a contested nomination at the party convention in Cleveland. Republicans in rural areas and fallen manufacturing cities have warmed to his populist message despite a backlash among party elites fearful that his insults of women, Mexicans and Muslims make him unelectable. The 69-year-old tycoon leads his home-state polls at 53.1 percent, with Ohio Governor John Kasich and Texas Senator Ted Cruz languishing at 22.8 and 18.1 percent respectively, according to RealClearPolitics. Addressing a raucous rally in Buffalo, he attacked his rivals, gave a rousing defense of New York values, which Cruz has insulted, and blasted party rules as he has lost recent delegate hauls to Cruz. "It is a rigged and corrupt system but we're going to get there and I believe we're going to do it much more easily than people think," Trump told the roaring crowd. "No New Yorker can vote for Ted Cruz." Cruz, who is widely disliked in New York, limited himself to only private meetings and television appearances in New York on Monday. 0 Response to "New York set to vote, Clinton and Trump tipped to win"